This week, two of the UK’s biggest grocery retailers, Sainsbury’s and Walmart-owned Asda, announced plans to merge. The combination will create the UK’s biggest grocery retailer, with total revenues of £51 billion ($37.5 billion). We think that it will also create the UK’s biggest retailer of nonfood categories. The new company will span online and offline grocery, two strong clothing brands and a large general merchandise operation. And it will offer fulfillment across a number of banners and store formats as well as home delivery that includes traditional delivery options and rapid delivery in grocery and general merchandise. In short, it will be the closest thing to an “Amazon crusher” that we are likely to see in UK retail—and it could serve as a template for retailers in other countries as they battle Amazon for market share. The merger could make Sainsbury’s-Asda the UK’s top apparel retailer. We estimate that the new company would have annual apparel and footwear sales of over £3 billion, setting up a rivalry with Marks & Spencer for the title of the UK’s leading clothing and footwear retailer. Marks & Spencer saw apparel-only sales of around £3.2 billion last year, we estimate, and those sales are declining. We estimate that the new combined entity would see total sales of around £9–£10 billion across apparel and general merchandise, making it the UK’s biggest nonfood retailer. That would put it ahead of Amazon UK, which booked revenues of £8.8 billion last year, though its gross merchandise volume including marketplace sales will have been greater than this. The variety store Argos, which was acquired by Sainsbury’s in 2016 and which sells around £4.1 billion of general merchandise per year. Asda’s highly successful George apparel brand, which is believed to generate sales north of £2 billion per year (we estimate that George sales totaled about £2.2 billion in 2017). Sainsbury’s newer but high-growth Tu clothing brand, which we estimate saw net sales of around £840 million last year. Asda’s and Sainsbury’s own general merchandise sales, which we think are likely to total approximately £2–£3 billion per year. The new company will lead in its range of fulfillment options, too. Argos has been an omnichannel leader for many years, having pioneered the concept of reserve online, pick up in store in the UK and having rolled out same-day delivery in 2015. Sainsbury’s and Asda each have mature online grocery operations, and Sainsbury’s also has a nascent one-hour delivery service called Chop Chop. 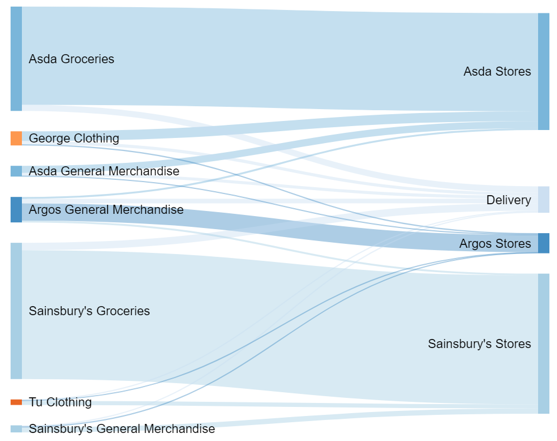 In addition, Sainsbury’s has a large network of convenience stores that it could use as local collection points. Sainsbury’s has already installed Argos shops-in-shops and collection points in its stores; this week, management noted that there is an opportunity to bring Argos into Asda stores, too. Such moves, together with the cross-selling of brands such as George and Tu in Argos, will create an impressive network that connects strong brands with a multiplicity of collection and delivery options. We think that the breadth and depth of the combined company’s offering will make it the market leader in terms of “anytime, anywhere” shopping. At the companies’ press conference on Monday, Walmart International CEO Judith McKenna said that Walmart is considering deploying Argos in the US and elsewhere, further suggesting that this mix of offerings could be one way for retailers in many markets to fight the growth of Amazon.